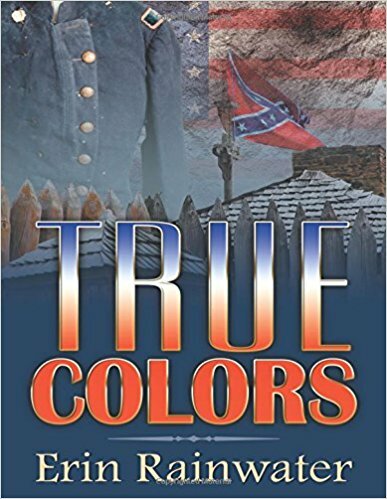 TRUE COLORS follows the adventures of Cassie Golden, a nineteenth century Pennsylvania woman who volunteers to work as a nurse in a military hospital in Alexandria, VA. She falls in love and marries an intelligence officer in the Union Army. Before their marriage can be consummated, he is called away for a secret assignment. Cassie continues working with the wounded while she waits for her soldier to come home. Then, without warning, she is kidnapped by Southern spies and taken to Richmond, the Capital of the Confederacy. There, she is shocked to see her new husband, now dressed in the gray uniform of a Confederate Colonel. This isn't just a romance set against a Civil War backdrop. It's historical fiction in the most intriguing sense of the term. Rainwater's characters interact with real people -- like Abraham Lincoln and Colonel Thomas Rose who escaped from the infamous Libby Prison in Richmond. Cassie Golden and Michael Byron's stories are interwoven with the smaller, lesser-known human events of the era and the larger well-documented incidents like the Battle of Gettysburg. This approach allows the reader to experience war viscerally rather than as an intellectual exercise. Every piece of this novel works to create a single impression -- from the author's character naming technique to the clever way that she reveals information to the audience to the colorful cover and large font layout. The research behind the book is solid. The plot is multi-faceted and the characters are believable. For example, despite the deep philosophical divides, Cassie and Michael find much to admire in their complex Confederate adversaries. However, for the sake of the drama there are pure heroes and pure villains too. There is the dastardly, all-powerful and artfully named Sergeant Powers who torments Cassie throughout her captivity. Then there is President Abraham Lincoln who is raised to the level of sainthood when viewed through Cassie's idealistic eyes and the gratitude of freed slave Maudie. Ms. Rainwater has created a book that plays in reader's head like a rainy-day movie. Cassie Golden feels called to leave her safe but lonely Pennsylvania farm to tend the Union wounded in Alexandria, Virginia. Love and conspiratorial intrigue enter her life there, both arriving in the form of an intelligence officer, Major Michael Byron. When duty sends him away, Cassie becomes unwittingly enmeshed in a mosaic of espionage, kidnapping, imprisonment and murder. Their unanticipated reunion only creates a chasm between them as sweeping as the one dividing the nation. Only the truth can bridge such a chasm. And truth is in short supply.